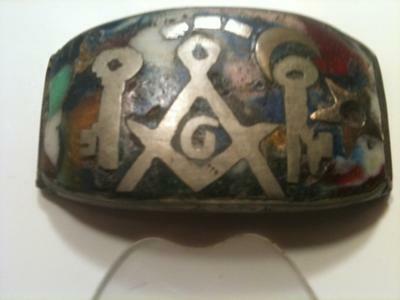 I recently acquired a very unusual piece of Masonic mosaic jewelry with masonic symbols embedded in a mosaic of colored stones. Despite all research, I have been unable to figure out anything about it. It's about 2.5 inches long and 1.25 inches wide. The base seems to be made out of silver or lead. The mosaic is made out of crushed, colored stones like lapis lazuli, jasper, cornelian, and others. It's a random pattern of crushed rock, not a mosaic pavement. 1. Gold five pointed star with circle in the center. 2. Half crescent moon in bronze. 3. Silver or lead compass and square with G.
Surrounding the compass are two pillars or the number 11. Perhaps the Temple of Solomon? Above the compass are three silver rectangles, all about the same size, in an arc. The piece is too small to be a belt buckle and the slots at either side are very thin. The object may have been a piece of a larger piece? At any rate, I'm completely baffled. Thought you may be able to help. Is there someone you could recommend to help learn more about the item? The 2 upright pillars are Boaz and Jachin which stood beside the entrance to Solomon's Temple. Within Freemasonry, all lodges are representations of Solomon's Temple. The Square and Compasses at the center of the piece with the "G" in the center is Freemasonry's logo. The moon is one of the 3 Lesser Lights of a lodge, which are the sun, the moon and the Worshipful Master. Stars are repeatedly mentioned within Freemasonry. The 5 pointed star may refer to the Masonic Blazing Star or it may refer to the 5 pointed star. Both, at their foundation, refer to a belief in Deity. As to this Masonic mosaic jewelry's purpose, I cannot say. I agree that it seems to be too rounded and too small to be a belt buckle. It is obviously hand made and, as such, is probably quite old. As such, it would be doubtful that the base is made of lead, as lead is a baser metal and would not symbolically be appropriate to be used in Masonic jewelry. It is much more probable that the base is made of silver. As to its age, I am not a jeweler and cannot unequivocally state its age, but if I were to guess, I would say that it is between 50-100 years old. Boaz, Jachin, the square and compasses, the star and the 3 rectangular brass insets above the square and compasses each have Masonic symbolism. Sun, moon and Worshipful Master. 3 Greater Lights of Freemasonry, which are the Square the Compasses and the Holy Scriptures. 3 Principle Officers of the Lodge: the Worshipful Master, Senior Warden and Junior Warden. 3 Stages of Life: Youth, Manhood and Age. 3 Degrees: Entered Apprentice, Fellowcraft and Master Mason. I hope this has been somewhat helpful to you Dann. If anyone else viewing this piece of Masonic Mosaic jewelry can shed further light on its usage, please feel free to share your own thoughts about it. Thanks for sharing it with us, Dann. Part Of An Ancient Weapon? Showed the piece to a friend of mine who is a Mason and also ex-military. He agreed that the piece was from Egypt or somewhere in the Middle East. Looking at the flat back portion, he also thought that it was a decoration for a dagger or sword. Since no one else asked about the back and my friend is a specialist in both weapons and a Mason, this may be the answer --- or at least the best guess to date. That said, still the piece still remains a mystery. I can't see the back or make out the "very thin slots at either side," but could it have been the slide from a Masonic bolo tie? I agree that the pillars are positioned for the standard Masonic symbolism, but have you noticed that they also appear to be keys? This may have belonged to a Lodge Treasurer. The use of the letter G is a relatively modern innovation, and would indicate that it was made either by or for an English speaker. In talking to several more people that have seen the piece in person, everyone seems to agree that very old, perhaps over 1000 years. They believe the origin to be the Middle East. It seems to be part of a larger item or some type of amulet. Since I am not a jeweler nor an art historian, I'm afraid I cannot comment with any authority as to the age of this piece of jewelry. It does appear to be very old. This may or may not be a viable idea, but have you considered sending the photo of it to National Geographic's website, or the History Channel and request to know if they might have any information about it? Who knows?... their art historians or archaeologists may find it to be of interest in a montage type of show about jewelry, Freemasonry, or art which they may do for television??? It's just a thought for you. I did check with a friend who specializes in stones and the stones that were crushed into the mosaic are from Afghanistan or the Middle East. The other information was very educational. Being as small as it is, perhaps the piece was designed to attach to a necktie? The 5 pointed star may be from the "Eastern Star" the Masonic Woman's Association. The Crescent Moon is also used by the Shriner's. It appears there are several keys depicted which are Masonic in origin.